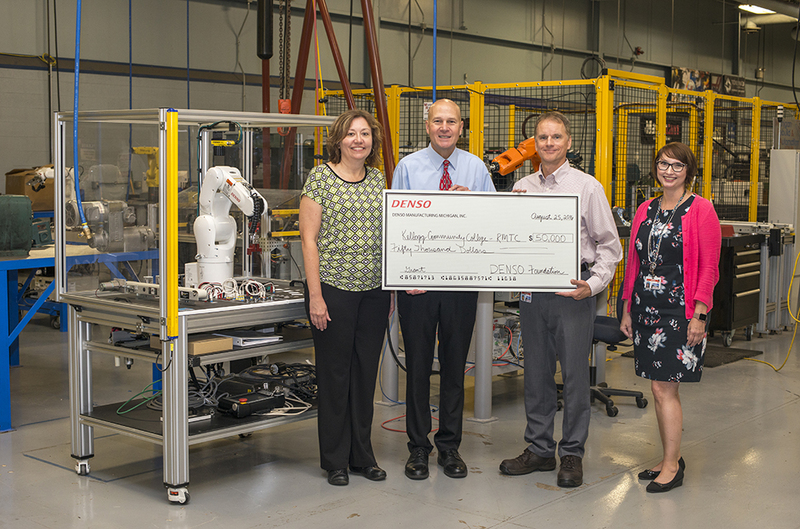 Kellogg Community College has been awarded $50,000 by the DENSO North America Foundation to purchase new manufacturing equipment to support student learning and worker training in Battle Creek. The one-year grant was awarded to the College via a DENSO Foundation grant program supporting higher education engineering programs and student projects that promote and enhance training required for entry into the automotive industry. Tom Longman, director of the College’s Regional Manufacturing Technology Center, where the new equipment will be installed this fall, said the grant will facilitate the kinds of hands-on, applied practice that is critical for student learning in industrial skilled trades. Karen Cooper-Boyer, member of the DENSO Foundation board of directors, said that DENSO is passionate about preparing students for careers in manufacturing and generating interest in these fields. The grant is the fourth DENSO Foundation grant awarded to KCC to fund new manufacturing equipment at the College since 2013. The funds were presented to the College by DENSO officials on Aug. 25 at the RMTC, which has seen several upgrades over the past few months. A new 8,400-square-foot expansion opened to students this summer, while $2.2 million in state funding for renovations and upgrades to the older 40,000-square-foot portion of the facility was announced by Gov. Rick Snyder in June. The state funding will be matched by an additional $2.2 million from KCC’s dedicated capital millage for upgrades to security, plumbing, mechanical and electrical systems beginning this fall. Pictured above, from left to right, are Mary George, Community Relations Specialist for DENSO Manufacturing Michigan, Inc.; RMTC Director Tom Longman; DMMI President Andris Staltmanis; and DMMI Communications Manager Sarah Frink.